via Naruto vs Jinchuruki and Tobi Final Fight : Naruto Shippuden Ultimate Ninja Storm 3 – YouTube. This week’s long run is 90 minutes, and I’m going to try a new route that is slightly longer than the route I took last week, but hopefully shouldn’t hit any pavement-less roads. It’s a 15.61KM route so I should be pretty shattered by the time I’m done. Next week’s long run is also 90 minutes, then 95 minutes, then 100 minutes, then 100 again, and then the training ends the week after. If I can do 100 minutes at a pace of around 7:00 min/km (slow pace), then a half marathon will take me 147.7 minutes, or about 2.5 hours. 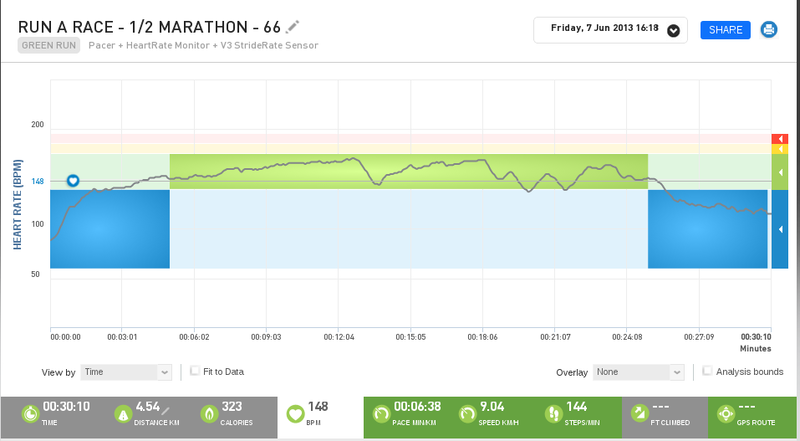 I can average about 6:40 now, so that will make the half marathon time close to 2 hours if I can keep that pace up. I’ll probably run the 15.61KM tomorrow, and gauge how far I can get in the 90 minutes. If I finish ahead of target, then I’ll use another route I have planned, which is 17KM. I also have a 19KM route planned, and a full Half Marathon route planned, so if I get faster, I can use those.